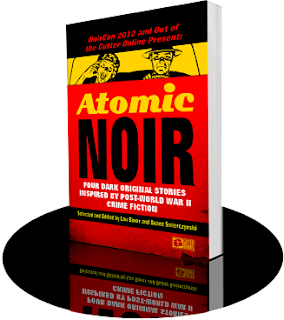 Thanks to everyone who has submitted work to the ATOMIC NOIR SHORT STORY CONTEST thus far. Round 3 is closed, and we have important news about Round 4. Submissions MUST close by October 7. This means this: You get less than 1 week to hang out in your corner and get the blood out of your eyes...Subs for the final round open on Sept 21 and close Oct. 7. So get it together. Check out the guidelines, polish up your ingenious Atomic era-inspired noir gems, and have them turned in within the above-outlined window. That's all. Get back to writing.